I really like this photo. Very despairing to think of this person, whoever they were, no one knows where, what or when. Also what is more despairing that to have only a hand printed epitath in a piece of concrete and no name. I like the graininess which matches the grains of sand in the soil. The shadow is more than perfect. I'm sorry I missed the vote. Would have given it a 10.
this must have been a long time ago! wow. nice find. it is sad that no one knew who it was. definately a reflection of despair for someone thoguh. focus and clarity are good lighting conditions are also good. angle and framing/cropping are ok. I wonder how this would have looked from a lower angle, or did the weeds cover up the writing? good luck in the challenge. I like the texture of this photo. The shadow is also nice. I like it. It says a lot by being so simple. Where's the despair? 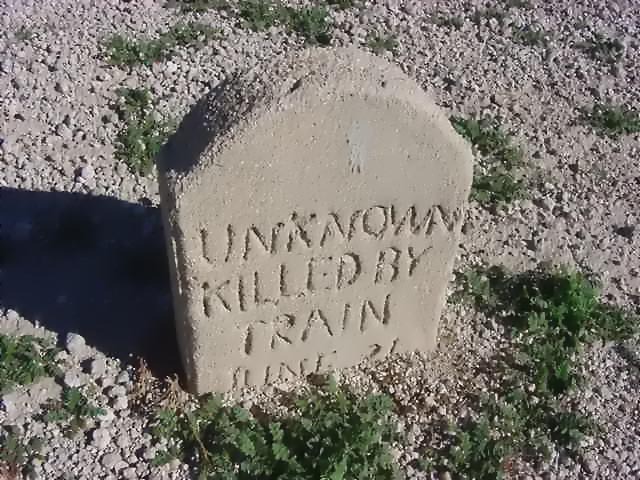 Someone's dead, sure, but their tombstone doesn't communicate despair. Just kind of a sad story. Effective presentation of the tombstone, nonetheless. seems more horror than despair. The eyes of those who loved this unknown victim would show despair, wouldn't they? Proudly hosted by Sargasso Networks. Current Server Time: 04/24/2019 02:49:42 AM EDT.